We offer no-nonsense oil changes for you vehicle. If you are looking for the most inexpensive place to get your oil changed and your vehicle serviced, we probably will not be your choice. However, if you are looking for someone you can trust to treat your vehicle with care and respect, than this is the place. We will change your oil and refill with our Chevron products or any other oil that you prefer. We offer both traditional and synthetic engine oils for you vehicle. We will refill your washer fluid. We will not give you a list of unnecessary repairs. We will give you an honest assessment of what your vehicle will require. 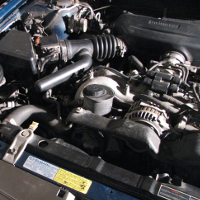 Synthetic Engine Oil, what does that mean? It is oil. It is not anything artificial or man made. It is oil that is refined to a more uniform state. This means that the oil is refined further in order that all the molecules are the same size. In regular motor oil for illustration purposes lets use fruit to imagine the molecules. Regular oil would have shapes like bananas, oranges, pears, cucumbers, potatoes and so on, all different sized and shaped molecules. When all of these molecules are together, they lubricate but just do not work together that great. For years, this has been good enough and probably still is, but many vehicle owners want more. Synthetic engine oil, imagine if the molecules were a fresh bowl of baby peas. They are uniform in shape and roll together very nicely. This is how synthetic oil reduced friction and wear in you engine. There are two big advantages to synthetic oil. First you oil change will last longer. We suggest 5000 miles. Second, you will notice easier starting because of reduced friction and that will result in a longer lasting engine.